President Bashar Assad’s regime continues to crack down on protesters as he resists pressure to step down. Nearly 300 civilians have been killed in the last ten days alone. Mourners wave Syrian flags and a photo of President Bashar Assad as they chant slogans at a mass funeral for 44 people killed in suicide bombings earlier this week. TENS OF THOUSANDS of protesters in Syria took to the streets of Homs today at the start of a visit by monitors from the Arab League – saying that the inspection is going to be a whitewash. The Arab League monitors have only just begun to deploy in the crisis zones of Syria today – and officials from the 22-member organisation were already worried that President Bashar Assad may be succeeding in undermining a mission intended to end the regime’s crackdown on protesters. Assad pulled back his tanks from the restive city of Homs after days of relentless shelling, Arab League officials suspect it is just for show, a tactic to forestall more international condemnation and sanctions — especially since the halt in the assault came just ahead of the observers’ arrival in the city. Nearly 300 civilians have been killed by government forces since Syria signed off on the peace plan on Dec. 19 and clashes between army defectors and regime troops killed another 150, mostly defectors. The regime continued its crackdown up till Monday night when the first team of monitors was due to land in Syria . Even Tuesday, the killings continued, with the Local Coordination Committees, an activist group, reported 30 dead from various parts of the country. The continued deaths and the sense that Assad is trying to make end runs around the observers threaten to undermine the credibility of the Arab League at a time when it is trying to be more muscular in dealing with conflicts. For decades, the 22-member body has been dismissed as a talking shop for dictators, but the eruption of the Arab Spring pushed it to revitalise itself — starting by siding with Libyan rebels against Moammar Gadhafi earlier this year. Arab League officials say they have no illusions that Assad will stop trying to crush a street movement that has raised the most serious challenge to the 40-year rule of his family. But while its members agree Assad must go, they are divided on how and are wary that an escalation in the crisis might bring international intervention. As a result, the observer mission was their best compromise. The league’s plan, agreed to by Assad, requires his regime to remove security forces and heavy weapons from city streets, start talks with opposition leaders, free political prisoners and allow human rights workers and journalists into the country. The observers are supposed to monitor compliance. Already, Syrian opposition groups have been deeply critical of the mission, saying it will simply give Assad cover for his crackdown. “The League wants regime change but at the lowest possible cost,” said one league official who is familiar with the deliberations within the body and is skeptical over the mission. Other officials argue that while the mission is not assured of success, it deserved a chance, warning the alternative to the Arab League peace plan is increasing violence and possible foreign military intervention in Syria a strategically located nation, with close ties to Iran, Lebanon’s Hezbollah and the militant Hamas group in Gaza. All Arab League officials spoke to The Associated Press on condition of anonymity to discuss the body’s internal deliberations. Several officials said league members were divided over the best approach for getting Assad out. Saudi Arabia, Qatar and their Gulf Arab allies favor Arab sanctions on the regime and referring the issue to the U.N. Security Council for action. The Arab League has already imposed economic sanctions on Syria , but Syria ‘s immediate neighbors opted out, weakening their impact. Egypt, on the other hand, heads a rival group that includes Sudan, Lebanon and Algeria which insists on giving the Arab peace plan a chance. The Egypt-led camp, the officials said, hopes that enough troops and weapons will be pulled out from Syrian cities to prompt Syrians to take to the streets in large numbers, putting Assad under the kind of pressure that forced Egypt’s Hosni Mubarak and Tunisia’s Zine El Abidine Ben Ali out of office this year. Before the redeployment of tanks in Homs on Tuesday, there had been no sign that Assad was implementing any of the peace deal’s terms or letting up on his brutal crackdown. Many believe that any easing will be temporary and limited to wherever the observers are located on any given day. In response to the Arab Spring, the league has taken steps away from its longstanding policy of staying out of the internal affairs of its member states. The new policy came into focus when the organization suspended Libya’s membership this year in response to Gadahfi’s crackdown on revolutionaries. NATO took the league’s withdrawal of support for Gadhafi’s regime as the nod it needed to launch monthslong airstrikes that crippled forces loyal to the dictator, who was captured and killed in October when his regime finally fell. But Syria is no Libya, league officials say. They point out that in contrast to Libya, the Syrian opposition is more divided and the army and security forces have remained largely loyal to Assad. Syria ‘s place is more sensitive in the Arab world — bordering Israel, allied to Iran and militant groups — so if things go wrong with an intervention it is potentially far more explosive. Proponents of the monitoring mission within the league argue an “Arab solution” is best. The use of monitors to verify the implementation of a peace deal is uncharted territory for the Arab League, founded nearly 70 years ago and headquartered in Cairo. “The Arab League’s effort is sincere but the organization has no previous experience in a mission of this kind,” said Bassma Kodmani, the Paris-based spokeswoman for the opposition Syrian National Council. Email “'Whitewash' - Protests rage in Syria as Arab League monitors arrive”. 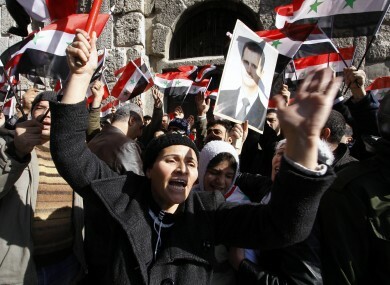 Feedback on “'Whitewash' - Protests rage in Syria as Arab League monitors arrive”.